Recent conflicts in Armenia, Iraq, Syria and Ukraine have demonstrated the widespread adoption of drones by state actors — as well as rebel and terrorist groups — for reconnaissance purposes and as improvised attack platforms carrying grenades or explosive charges. Most recently, Russian air-defense vehicles and electronic-warfare assets in Syria reportedly defeated a simultaneous rebel attack by 13 kamikaze drones. For decades the U.S. military has counted on fighter jets to achieve air supremacy, and focused land-based defenses on long-range Patriot missiles as a counter to tactical ballistic missiles. But while long-range missiles and patrolling jet fighters may be able to engage a few drones at a time, both are impractical to employ against large numbers of tiny systems that might be dramatically cheaper than the missiles used to destroy them. In many cases, fighters and long-range SAMs will also simply be to far away to intervene against such small, low-flying threats in time, particularly if they are targeting front-line troops. But this leaves the U.S. Army in a pinch. Since 2004 it has drastically downsized its SHORADS force from 26 battalions in 2004 to just nine, only two of them active-duty, and phased out its last armored anti-aircraft system, the M6 Linebacker. The Linebacker was a Bradley Infantry Fighting Vehicle, a 27-ton heavily armed tracked troop carrier, with its TOW anti-tank missile launcher swapped out for a four-round Stinger missile system, with eight reloads in the hull. The heat-seeking FIM-92 Stinger became famous in the 1980s when the United States smuggled hundreds of the missiles to mujahideen insurgents in Afghanistan, who used them to cripple the Soviet Union’s helicopter-centric counterinsurgency campaign. The fire-and-forget missiles home in on the heat signature of an aircraft, and can strike targets up to three to five miles away while traveling over twice the speed of sound. Placing the Stinger on an armored vehicle allowed it to accompany mechanized and tank formations on offensive operations while affording more protection. The Linebacker retained the Bradley’s 25-millimeter autocannon for ground engagements, which has limited application against low-flying helicopters. The M6 saw plenty of combat in Iraq. For example, Tip of the Spear: U.S. Army Small Unit Actions in Iraq describes an engagement in April 2004 in which a Linebacker platoon of the Fifth Air Defense Artillery Regiment sustained damage from a rocket-propelled grenade near Abu Ghraib while destroying suspected roadside IEDs. Later the same day, an M6 from the unit blew up a taxi that was ferrying insurgent RPG teams. Obviously, actions such as these did not involve any engagements against aerial targets. Unlike today, cheap civilian drone technology simply wasn’t that prolific. As a result, starting in 2005 the U.S. Army spent millions of dollars converting its Linebackers back to standard M2 Bradley models, retiring the M6 entirely. This has left the AN/TWQ-1 Avenger Humvee as the only mobile SHORADS system maintained by the U.S. military. The Avenger mounts two four-round Stinger pods, as well as an M3P .50-caliber machine gun — a faster-firing type better optimized for anti-aircraft use than the more common M2. Four hundred remain in service with the Army and Marine Corps out of an original force of 2,000. However, a Humvee is obviously more vulnerable than an armored fighting vehicle — and the heat-seeking Stinger has much shorter-range than air-defense systems such as the Russian Pantsir-S, which has multiple radars and radio-directed missiles that can strike targets 12 miles away or farther. Nor is the Stinger’s dual infrared/ultraviolet seeker optimal for taking out drones, which generate less heat than a helicopter or jet fighter. Nonetheless, the Pentagon has rushed 50 Avengers to reinforce NATO forces in Europe following reports of the wide-scale use of Russian drones in Ukraine, which shut down sensors and communication systems and directed deadly artillery fires. Indeed, the Army recently tested an upgraded Stinger with a laser targeting system and proximity-fused warheads to help overcome drones’ smaller heat signature. 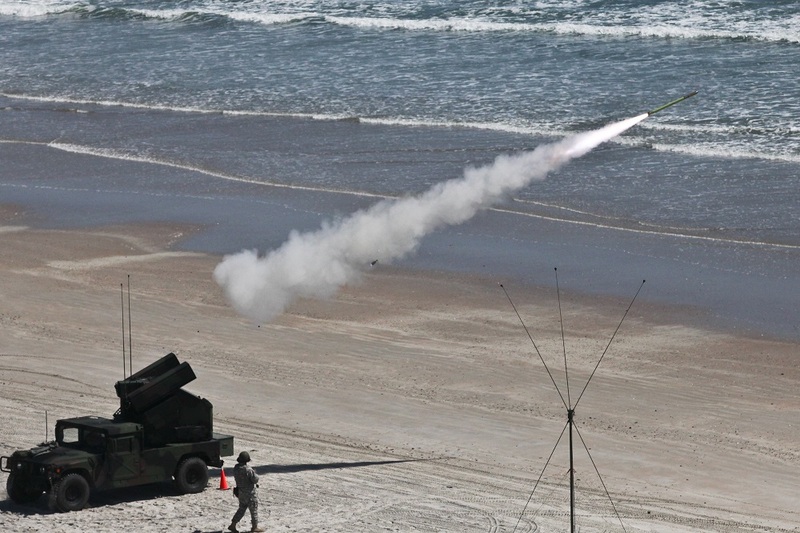 Now the Army would like to regrow its Air Defense Artillery force to one battalion for each of its active-duty divisions, in addition to one battery attached to each of roughly 31 brigades — though whether funding for such a force exists is another matter. In January 2018, the service began training 600 more Stinger teams for its light, mechanized and motorized infantry battalions. Presumably, many of them will have to dismount from their vehicles to fire. Meanwhile, the Pentagon is testing a wide variety of new vehicle and short-range anti-aircraft weapons to give it true a maneuverable SHORAD capability. There are proposals install anti-aircraft missiles on a range of new vehicles — including the Bradley. A new SHORAD Bradley upgrade offered by BAE would come with a new thermal sight, short-range AESA radar and drone jamming systems. In addition to the Stinger, it could also employ a ground-launched version of the AIM-9X Sidewinder, a highly-maneuverable heat-seeking air-to-air missile, as well as radar-guided Hellfire anti-tank missiles repurposed for anti-air engagements. These weapons could also be installed onboard Stryker eight-wheeled armored personnel carrier, or JLTVs, a successor to the Humvee. Earlier, the U.S. Army cut funding for the SLAMRAAM, a Humvee mounting medium-range radar-guided AIM-120 missiles. However, anti-aircraft missiles may simply be too individually expensive to serve as a cost-efficient counter to cheap drones, which will likely be ubiquitous on a modern battlefield and could theoretically be dispatched in very large numbers in a swarm attack. Thus, the military has tested out a wide-variety of laser and microwave weapons to literally burn drones out of the sky at almost no cost per “shot,” though most such weapons take several seconds to achieve a destructive effect, and may not be fast enough to destroy an incoming rocket or artillery projectile before it impacts. 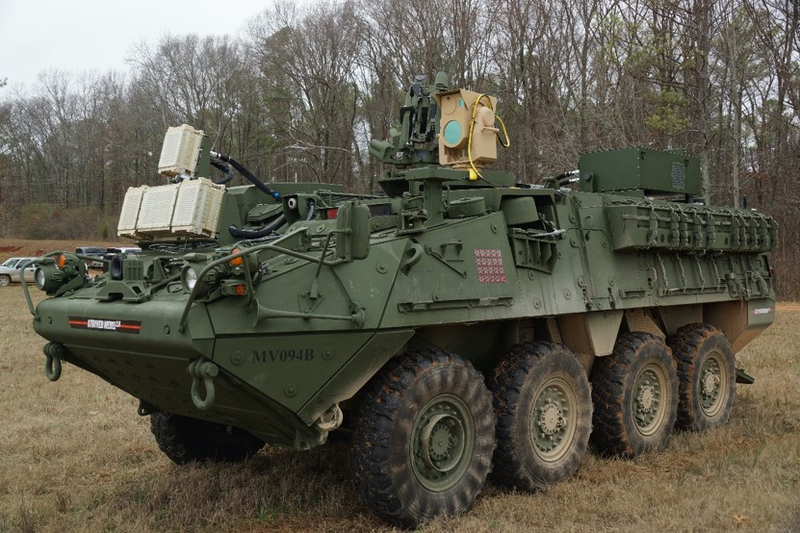 Still, a Stryker armed with a five-kilowatt laser successfully destroyed 21 out of 23 drones in an exercise in May 2017, so laser-armed Strykers and JLTVs are a distinct possibility. For now, though, the Army hasn’t settled on a mobile direct-energy weapon system it is fully satisfied with. Reintroducing radar-guided anti-aircraft cannons like the M163, which mounted a Vulcan rotary cannon on an M113 APC, might be another means to close the cost-efficiency gap. Air-bursting 30-millimeter cannons and 25-millimeter grenade launchers have been proposed with this application in mind. In any case, a proper anti-drone system would also come with electronic-warfare systems to jam or even hijack the communication links connecting the drones to their handlers — the method reportedly used by Russian forces in Syria to disable six out of 13 attacking drones. The new age of drone warfare may mean that dominating the skies against manned aerial threats will no longer suffice to protect troops on the ground from the drone threat, even from adversaries with relatively limited resources to call upon. However, the capability gap is also a problem when facing more traditional threats from artillery and manned aircraft. The Army and Marine Corps have relaxed on their short-range air defense capabilities since the end of the Cold War under the assumption that U.S. fighter jets would sweep enemy air power from the skies, as occurred in the 1991 Gulf War. However, a near-peer adversary’s air force may not be defeated immediately at the local level in the opening days of the conflict, leaving forward-deployed ground forces exposed. 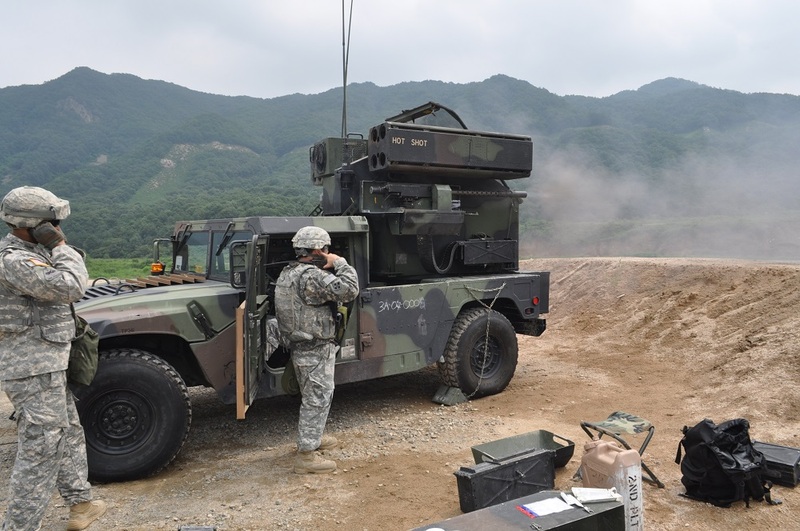 Furthermore, cruise missiles and rocket artillery are also proliferating around the world, and sufficiently agile short-range air defenses could help mitigate the damage inflicted by them if deployed both to accompany mobile frontline units and at key rear-area bases.